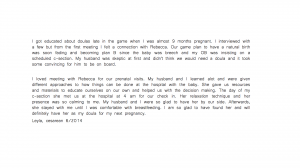 When my husband and I learned we were pregnant with our second child there was no doubt in our minds we would be working with Rebecca again as she is one of the warmest people we know. I don’t consider myself “tough” when it comes to pain or discomfort. Having given birth to two beautiful children I can say that nothing you do can prepare you for the exact feeling of labour. 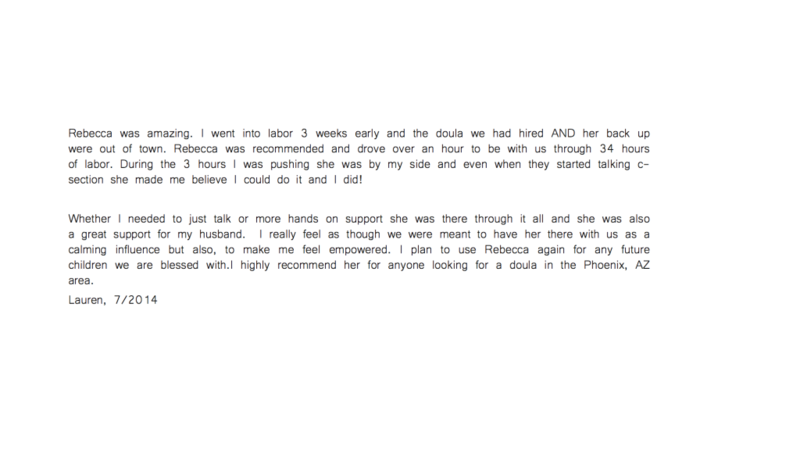 When I look back on my childbirth experiences I recall having the best support system in my husband and my doula Rebecca. We were blessed to have her with us for the birth of both of our children. Since my first birth, did not go 100% to plan I was really wanting a smooth natural birth with my daughter. 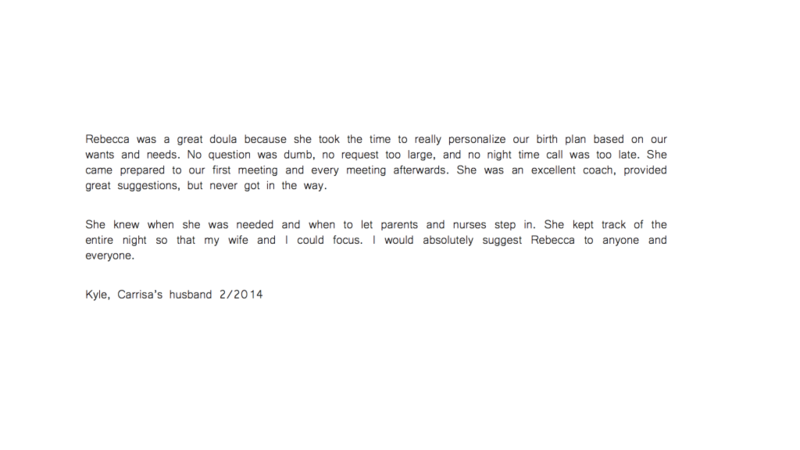 The stars aligned that day and with the love and support of Rebecca I was able to stick to my birth plan. I recall moments where I was in and out of consciousness and Rebecca was coaching me through those moments of doubt. She was truly and advocating for me and for my baby. Her genuine support was invaluable. 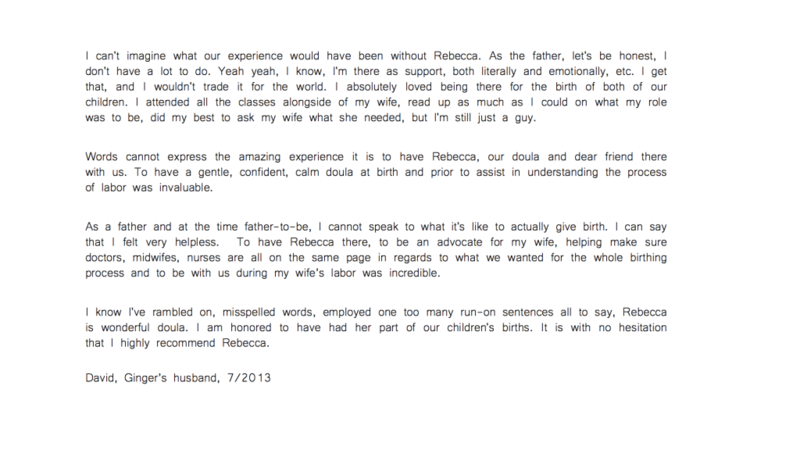 Rebecca truly empowered me to trust my body and I cannot express the gratitude in my heart for her support. 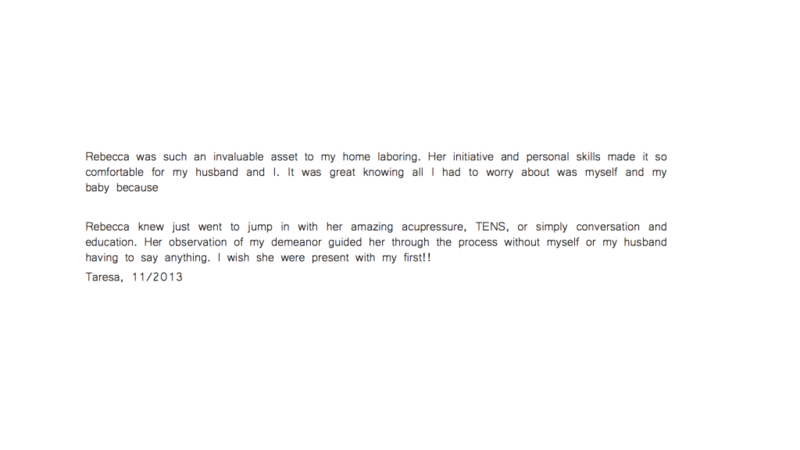 Working with Loving Touch Doulas was a wonderful experience! After two difficult deliveries, my husband and I decided to seek out a Doula for our third and final child. After meeting with several candidates we selected Rebecca. What a great decision we made! 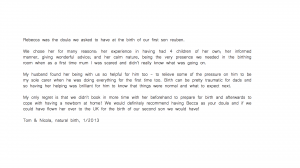 From the prenatal visits, to the delivery room, and post natal contact she was phenomenal. Despite it being Christmas Eve, she was available at the hospital for us when we needed her. Though my perfect delivery didn’t turn out to be the way I had initially hoped, she was very supportive. Rebecca was the voice of calm during the storm. Her cool collected attitude was exactly what we needed to get through the stressful anxious delivery. She allowed me to be in control of my labor, while supporting every decision I made. I was grateful to have someone with so much compassion and understanding in my corner. We were thankful that she didn’t try to take control or dictate how I would deliver, even after my initial birth plan changed and labor slowed. 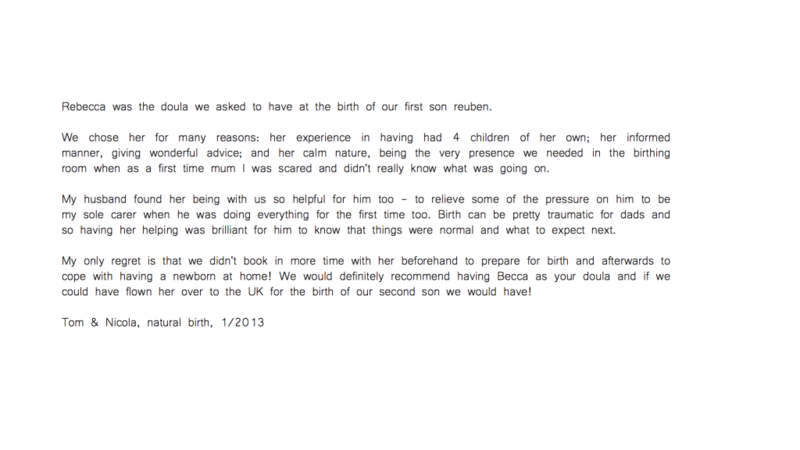 After the delivery she remain in close contact and was extremely supportive and helpful when some complications arrived. 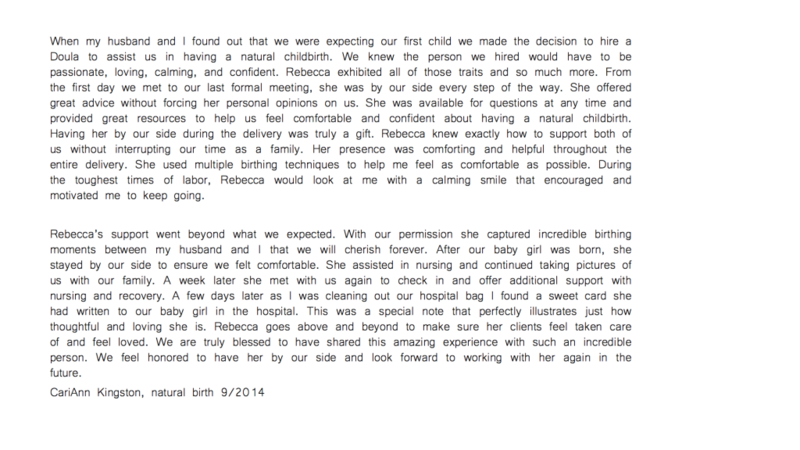 In addition, we also took advantage of her encapsulation and birth photography services. Both were remarkable, and indescribable. Her work is simply amazing! 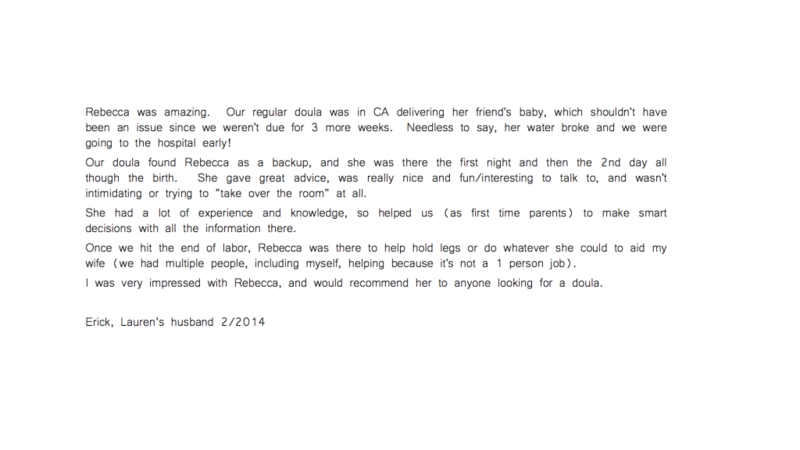 If you were looking for someone to remain calm and support you every step of the way, Rebecca is the perfect match. After a lot of research about VBAC, I quickly realized that I was going to need the support of a doula to help guide me through the process. 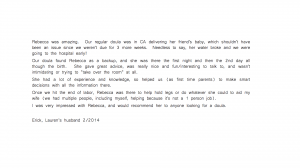 Rebecca came highly recommended by a friend, and after our initial meeting, my husband and I both knew that she would be a good fit. She has such a peaceful and calming energy about her that instantly put our fears at ease. We learned so much from the education that she provided, which helped me come to the realization that in order to have the best chances at the type of birth that I desired, I would need to switch providers. 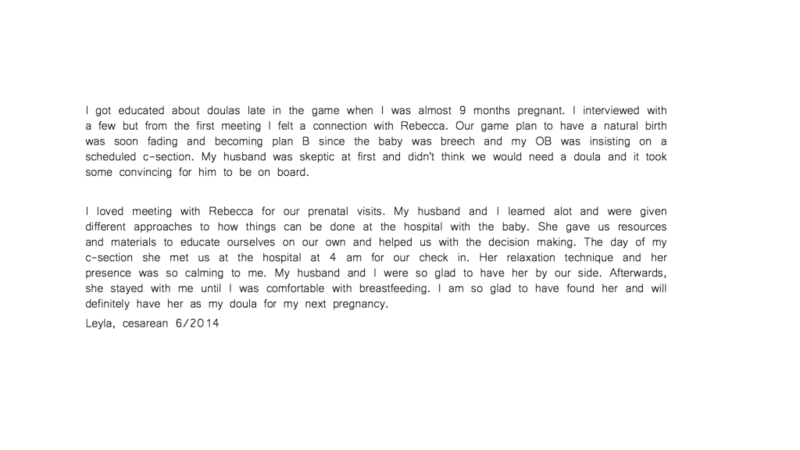 The idea of finding a new provider so late in the game was overwhelming to me and was not an easy choice to make by any means, but Rebecca made the process less scary and helped me find a group of providers that were more open to some of my birth preferences. 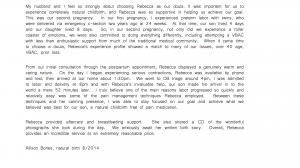 I made the switch at 34 weeks and had Rebecca’s support every step of the way. 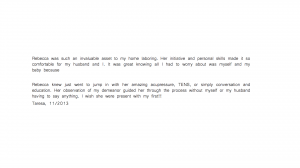 Her frequent communication through text was invaluable and helped me to feel encouraged whenever I felt unsure, especially after my due date came and went. 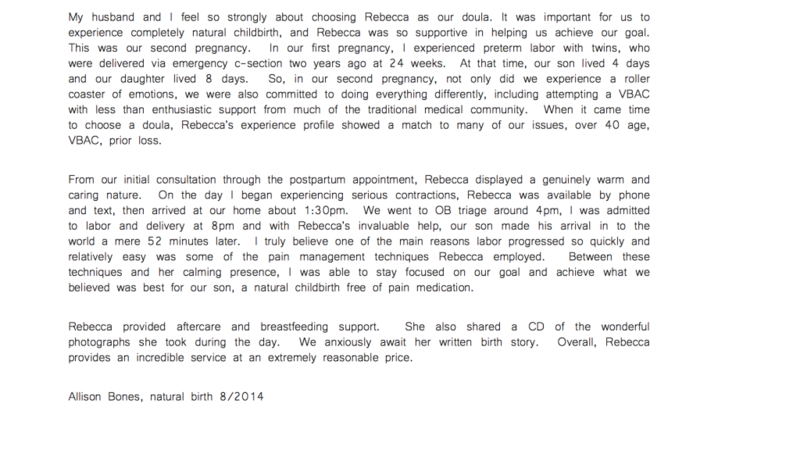 Once I was in active labor, Rebecca met us at the hospital and never left our side. 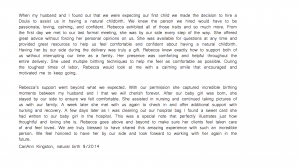 What happened in the next 5 hours was a bit of a blur, but I remember thinking how calm and professional Rebecca remained, even during moments where I would have been stressed or not able to communicate clearly. She was so graceful in the way that she worked with the nurses to help us labor in positions that I would have never imagined myself in. 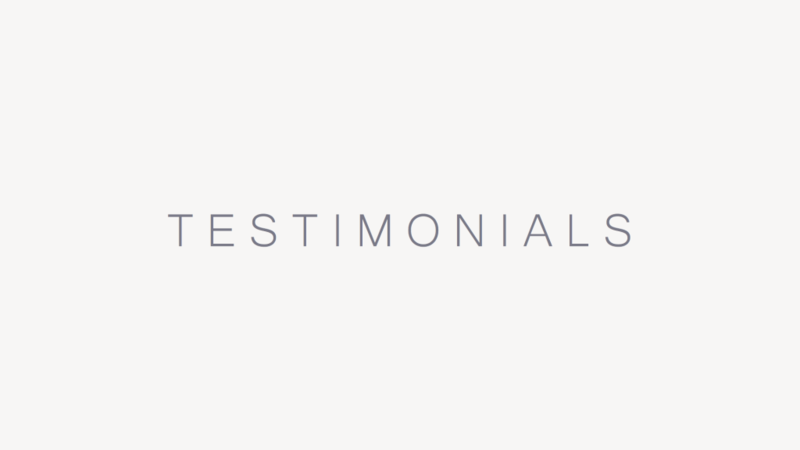 There were many moments where I doubted myself, but in the end, it was Rebecca’s encouragement that helped me to find an inner strength that I didn’t even know I had and I was ultimately able to achieve a fully unmedicated VBAC. I will never forget how empowered and supported she made me feel during one of the most rewarding experiences of my life, and for that I will be forever grateful.